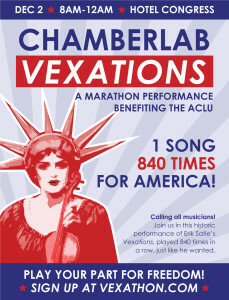 On Saturday, December 2nd, 2017, ChamberLab (and friends) successfully played Erik Satie’s Vexations 840 times in a row in a marathon performance lasting nearly 16 hours, and in the process WE RAISED $16,731.85 FOR THE ACLU OF ARIZONA! Read all about this historic performance at www.vexathon.com, and also see photos and videos. It was … it was something else entirely.